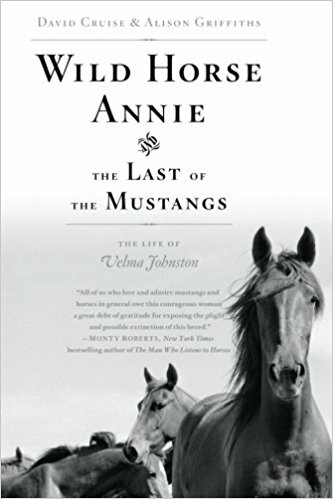 If you’ve read Marguerite Henry’s Mustang: Wild Spirit of the West, then you have some passing familiarity with the story of the American mustangs and with Velma Johnston, the Nevadan housewife who made it her personal crusade to save them. If that’s all you’ve read about the preservation battle behind the mustang, then you’ve only got a quarter of the story. This book is a superb way to get the rest of it. Velma Johnston was born in small-town Reno, Nevada. Stricken with polio at an early age, she grew up solitary, smart, and driven. She spent her entire life in pain from post-polio syndrome and facing a world that judged her harshly for the hunched back and misshapen face that polio left behind. One of the biggest strengths of this book is its unflinching, compassionate look into Velma’s life, achieved through a deep dive into her personal papers – tens of thousands of pages of letters, primarily. The Velma you get to know through this book would have initially said she was happiest as a successful executive secretary to the owner of a real estate business and a ranch wife. The trajectory of her life changed when she followed a truck dripping blood to discover that it was full of badly injured and dying mustangs. She and her husband Charlie were gradually drawn into a life of activism as they started finding and releasing mustangs that had been rounded up for dog food, then networking to stop roundups before they started. Soon, Velma was the central figure in a widening campaign to ban mustang roundups by airplane. The book doesn’t shy away from the cruelties inflicted on mustangs, and it does a good job of dispassionately presenting the various arguments for and against the mustang. It’s perhaps a bit light on the history of the mustangs (a little more time spent on parsing the difference between “wild” and “feral,” and the different emotional weights to each, would have given context to one of the main points of disagreement between mustang activists and cattle men), but gives a pretty decent overview of the ecological challenges of the Western ranges. As someone who knew the broad outlines of the story, I found this telling of it to be superb. It was tightly and engagingly written, well-researched, and had a strong narrative and tight focus on Velma herself. Nor did it shy away from Velma’s failings and character flaws, particularly in her dealings with photographer Gus Bundy and then in her relationship with Marguerite Henry (which began warmly but grew overly emotional and difficult). The section dealing with Henry was actually one of the best in the book, since it allowed both for a grounding of the broader story and for a reflection on Velma’s life and character. 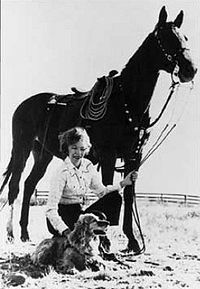 Ultimately, the last chapter after Velma’s death is the most unsatisfying; she passed away just in the midst of the architecture of wild horse management as we know it today, with its inherent contradictions and fatal flaws. It’s especially depressing because she fought for a comprehensive scientific range management from the start, and never saw that urgently needed piece of the puzzle realized. Without thoughtful, objective study, it was inevitable that we get to the place we are now, where no one can even agree on the number of mustangs in the West, much less how they actually use the range and how to effectively balance the needs of the flora and fauna. In that last chapter, Cruise & Griffiths bring the fight quickly up to date and touch on the process of adoption and the regular Congressional attempts to round up mustangs for slaughter again. They also point out how deeply unsatisfying Velma herself would’ve found the holding pen system, in which thousands of mustangs are rounded up and simply transferred from the range and pastured on private land, paid for by tax dollars. Despite its muddy ending, this is a really terrific book. I’m very picky about my narrative nonfiction: the writing has to be good, the interpretation deft, and the research solid. This ticks all of those boxes. I generally have even less patients for topics I already have a background in, but this holds up to that test as well. I genuinely couldn’t put it down. If you’re looking for a thoughtful read about horses and history, I strongly recommend this. 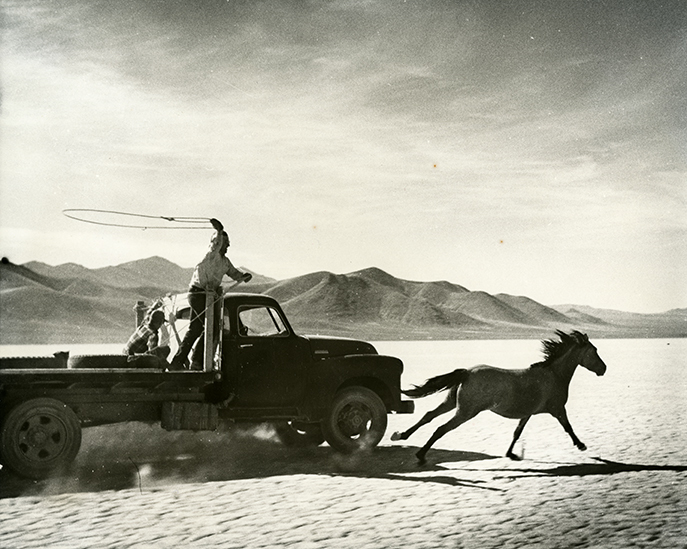 If you want to understand more about mustangs and how we’ve reached this point in our national discourse about them, it’s essential reading. Previous Post House Post: Basement Insulation! I added it to my amazon list. I loved the Marguerite Henry book as a kid.